Combine witch hazel, vegetable glycerin, and essential oils in spray bottle. Walk out of bathroom, with your head held high, like a boss&mdash;or rather like a unicorn or some other magical being no one could ever imagine pooping. For this to work, you've gotta be really careful about covering all the toilet water. This spray worked well for me. I couldn't smell a hint of poop after I went Number 2. 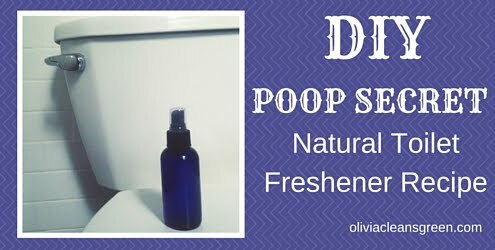 Poop Secret made no difference when my husband went, but he's not as detail-oriented detail-obsessed as I am and just gave the toilet 3 quick sprays. No bueno. In my opinion, it's kind of annoying to have to make an extra step before pooping, especially if you have to be that mindful about it. I'll pop this out for guests and use this when I'm in public spaces or someone else's home. In my own bathroom, I continue using one of my many other natural alternatives to air freshener after I poop. Did you try my Poop Secret Recipe? How did it work for you? If you've also used Poo-pourri, I'd love to know your thoughts on a comparison between the two.